The Brazilian scored from the spot in injury-time to hand the Men of Steel a rare win. Jamshedpur FC edged Bengaluru FC 1-0 Indian Super League (ISL) 2017-18 at the Sree Kanteerava Stadium in Bengaluru on Thursday. 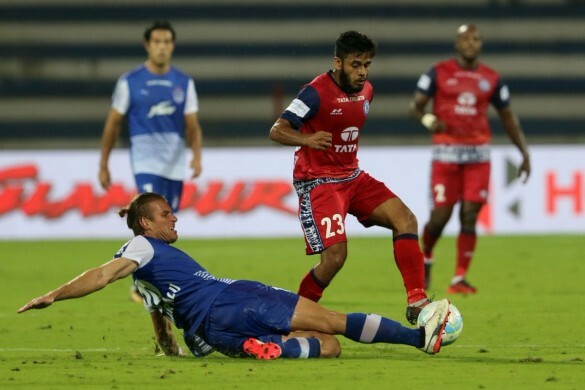 Trindade Goncalves’ last-gasp penalty edged the Blues to their third defeat of the season as Jamshedpur – with another clean sheet – won their second fixture of the campaign. Both teams started cautiously as the ball was played mostly around midfield with neither side trying to take the plunge. The first chance of reckoning fell to the home team in the 19th minute when Miku showed lovely footwork to outfox Tiri on the right flank and put in a deft cross towards the centre. However, Sunil Chhetri could not get enough power on his header as Shouvik Ghosh cleared his attempt on the line. Chhetri was at it again four minutes later when his volley from a cross hit the side netting, as the Blues started taking charge. A minute later, Erik Paartalu got on to the end of a Subhasish Bose cross, but under no pressure, managed a tame header that Jamshedpur custodian Subrata Paul held on to with ease. Miku and Paartalu then tried their luck from distance, but on both occasions, the shot although on target was directed straight at Paul who gathered comfortably as the sides went into the break locked at 0-0. The first chance after the restart fell to the visitors, when Bengaluru failed to deal with a Jerry Mawhmingthanga cross in the 54th minute. It fell kindly for Kervens Belfort, but he could not get a proper shot away as keeper Gurpreet Singh Sandhu made the save. A minute later, the Haitian set up substitute Farukh Choudhary on goal with a deft touch. Choudhary however, put in a heavy touch that allowed the ball to go out of control. Just a minute after the hour mark, Belfort fed Jerry with a lovely through ball. However, with the angle slightly against him, his shot went just wide of Sandhu’s far post. Almost immediately after, a Bengaluru counter saw Udanta Singh’s shot from a tight angle forcing Paul into a save. Chhetri then fashioned a chance in the 73rd minute when he cut in from the left and let fly. Paul spilt the ball, which luckily fell to a Jamshedpur defender before being cleared. Bengaluru’s captain then had the best chance for his team when he was fed a lovely ball and managed to get on the other side of Jamshedpur’s defence. Paul was quick off his lines though and made himself big to block a powerful shot. Jamshedpur were then presented a glorious opportunity right at the end when Rahul Bheke brought down Sameehg Doutie inside the box in the 90th minute. Goncalves stepped up and sent Sandhu the wrong way to seal the win for the visitors. The 1-0 win meant Jamshedpur kept their fifth clean sheet as the Blues lost their second consecutive home fixture.